That is most certainly true when it comes to motorbikes and when it comes to the bits and pieces that get bolted on, stuck on, replaced etc – whether for genuine performance improvements or as is often the case, simply to improve the aesthetics of the bike, or sometimes just as in other parts of adult life, taking precautions and using protection is often just a sensible thing to do. But improvement of course often comes first and foremost in the eyes of the owner. 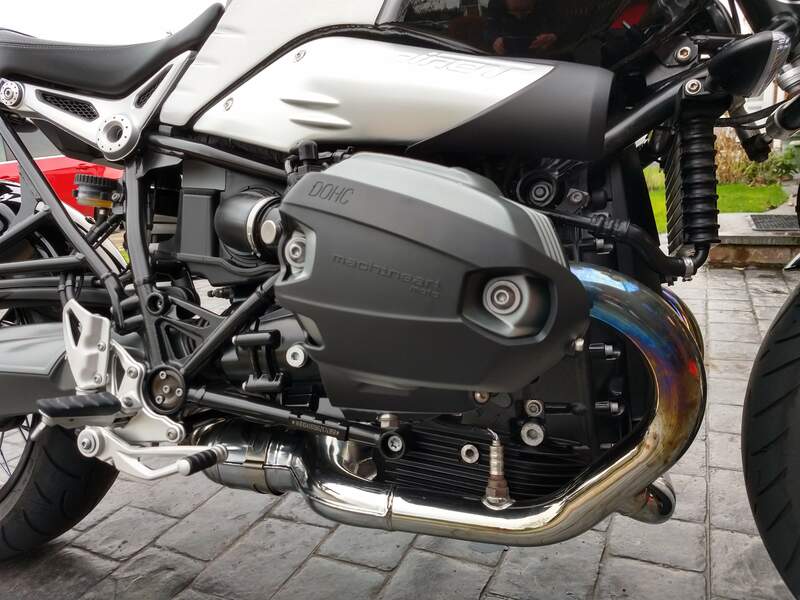 In my last Blog post I wrote about the exhaust tips that I had added to my RnineT – I think they are lovely, but doubtless there will be others who think they are an abomination of the original design, there are others who may well think what on earth is the point of adding them – just change the whole exhaust system! I have recently fitted a pair of engine case covers to my RnineT – a well-chosen birthday gift from my wife. They were ordered from Nippy Normans and as she hasn’t mentioned that there were any issues with the order and dispatch of them I’ll assume the service was at the normal levels that I have experienced in the past when using them. They are the Machine Art brand – an American based company that design, manufacture and supply a whole range of parts for the BMW range of bikes or to give them their ‘proper’ name machineartmoto. It’s the same company that manufacture the Mudsling – which to be honesty isn’t an add on that’s to my taste. The X-Head DOHC is designed to protect more of the cylinder head surface than any other guard in the event of a fall. Even if it gets away from you in the driveway, the inertia will cause the bike to roll onto the face of the cover before the bike settles down on the bottom of the cylinder. When off-road riding, X-Heads work together with crash bars to prevent damage from rocks that can get past the bars. Behind the tough nylon shell is a thick rubber liner that helps absorb impact force against the cylinder. The thick shell scrapes when dragged along the ground, but it does not break. The covers are simplicity to fit – they only go one way and thee are just three fastenings to remove and replace – the casings arrived with instructions, stainless steel bolts and washers and really do take just a few minutes to fit to each side of the bike – the product itself is made of a pretty tough nylon shell with a thick rubber liner behind it – apparently to help absorb impact in the event of a fall. The image below if from the Machine Art website.